We’ve come to enjoy afternoons spent touring local tide pools. 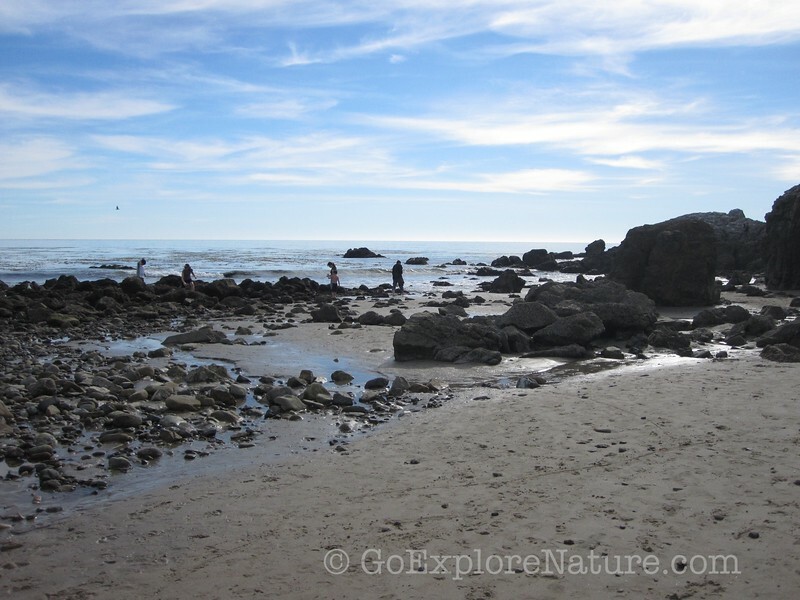 We’ve checked out Point Fermin State Marine Park in San Pedro, Abalone Cove in Rancho Palos Verdes and the tide pools at El Matador State Beach in Malibu. 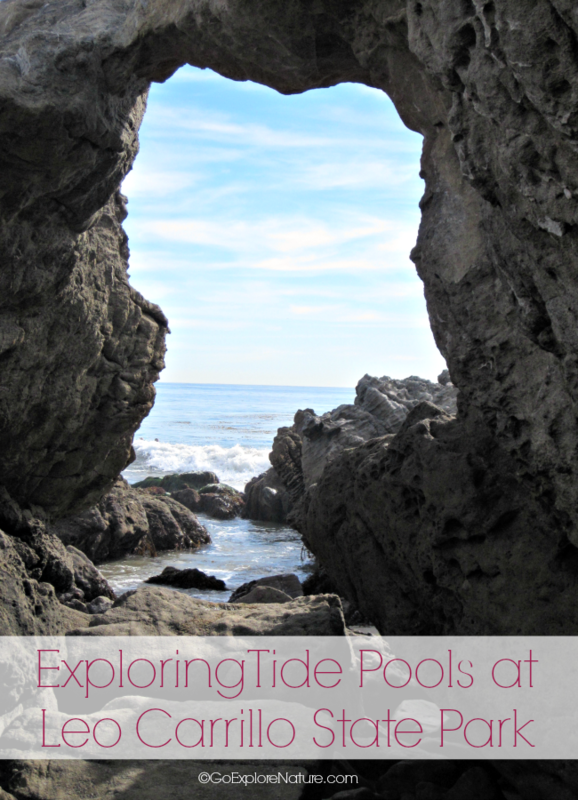 So this month we wanted to try exploring tide pools at Leo Carrillo State Park for our family nature club adventure. This outing turned out to be our most popular yet, with a whopping six families and nearly 20 kids. I was thrilled to see so many people excited to be outside exploring nature. Leo Carrillo certainly didn’t disappoint. It’s a short stroll to the beach from the parking lot, and an even shorter walk to water’s edge. The tide pool discoveries began almost as soon as we reached the rocky shore. We quickly spotted sea anemones (tons! 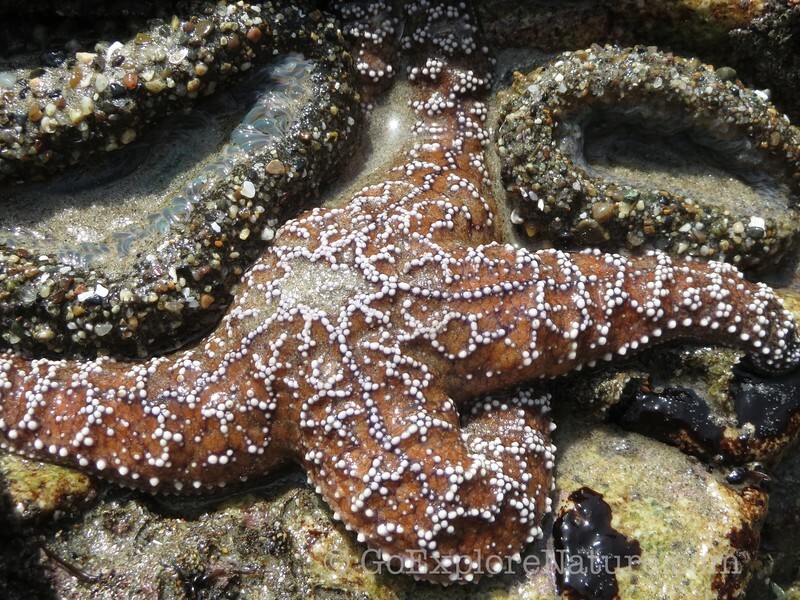 ), sea stars, sea urchins, mussels, barnacles and crabs. The group spread out as each kid seemed to be eager to explore something different. 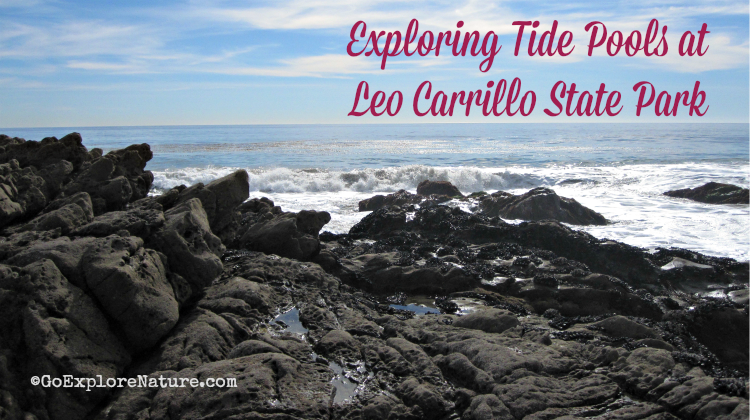 That’s what I loved most about Leo Carrillo – there really was something for everyone. In addition to the tide pools, there were cool caves that created “tunnels” The Little Explorer just couldn’t get enough of. There were also plenty of rocky outcroppings exposed during the low tide – perfect for little climbers. When you reach the top, you are rewarded with hidden pools rich with marine life. Oh, and the view is pretty cool, too, if you’re in to that sort of thing. In addition to taking a dip in the “pool” (which was about knee-high on my 6-year-old), some kids were moving rocks in to the narrower parts of the stream to create a dam. 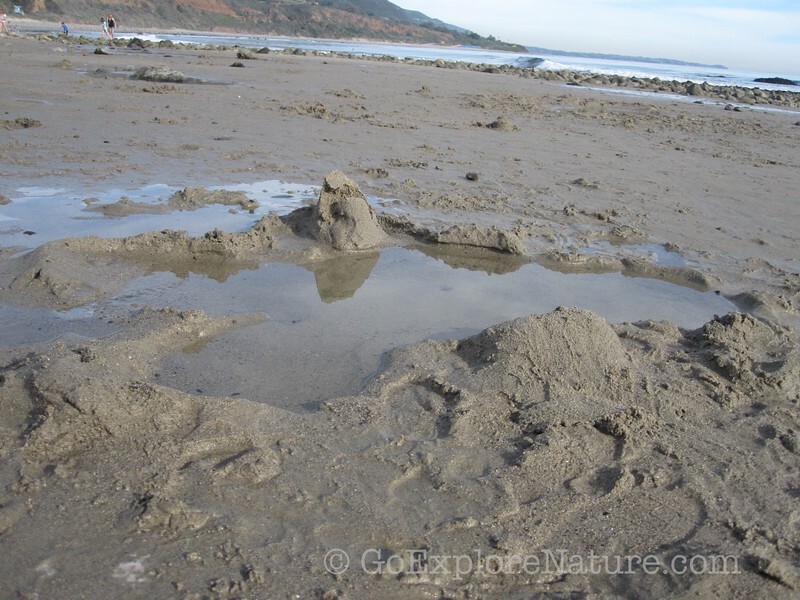 Still others were building sandcastles (and drip castles, too). It felt like one big nature playground. For the most part, the kids were sandy, soaked and begging for more. And that, to me, is one perfect way to spend an afternoon. Wear the right shoes. Opt for water sandals or go barefoot (just keep in mind that the there are lots of rocks to climb on, so sensitive feet may prefer shoes). Bring a towel & spare clothes. The kids will get wet and sandy so a change of clothes is a must. A bathing suit, towel and sand toys may come in handy, too. Show your kids how to respect tide pool life. Don’t remove any animal or poke at it, leave things where you find them & take care not to walk on marine life. 2016 Note: The following construction alert is currently in effect: A project to enhance endangered fish habitat, public beach access and water quality will close vehicle access to the beach, all day-use parking, and the group campground until further notice. Leo Carrillo State Park is 28 miles northwest of Santa Monica on Pacific Coast Highway – about an hours’ drive from the Westside. While you’re in the area, you might want to stop by one of these 10 nature destinations in Malibu. Note: The family nature club mentioned in this post no longer exists. Of course, we still spend lots of time exploring the outdoors with our kids in Los Angeles! Nope – we&#39;ve parked in the main lot at Leo Carrillo (paid lot). Is there more than one?! Can you tell me exactly where the caves and tide pools are? I&#39;ve been to Leo Carillo, and I don&#39;t know where they are.<br />Thank you! Love it there BTW! @Liz: Nice to meet you! I love meeting people who enjoy connecting with nature wherever they call home. @Joyce: One thing I love about having kids (or spending time with them like you do) is the chance to be silly &amp; play without inhibitions. There&#39;s so much to learn! @Jen: I can&#39;t believe you haven&#39;t been tide pooling before! Both you &amp; the kids will love it, I promise!<br /><br />@Rachelle: Thanks for sharing your memories – would love to have had you join us! 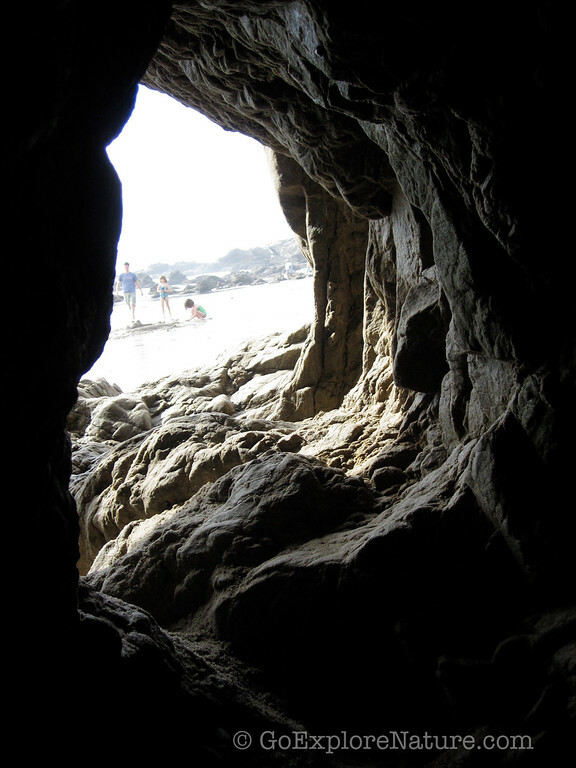 I love Leo Carrillo, and have so many fond memories of playing there as a child. It&#39;s just amazing how close it is to the urban grind of LA! I wish we lived closer so we could come out and play with your group. I have never been tide pool exploring before. This is something I need to actively search out on our next few vacations! The kids would love it. @Nicole: LOL – we&#39;d love to have you be an honorary member of our group! I don&#39;t know what makes me more jealous: the chance to go tide pooling so close to where you live or the 80 degree, sunny day. Regardless, I really want to be an honorary member of your group!